Blog posts tagged "healthy oil"
Does Modifilan Brown Seaweed Extract Work? That is a darn good question. Does it work? Will you lose weight if you use it? Lets start the conversation by saying Modifilan was designed as a natural detox remedy to cleanse the body of heavy metals and radiation poisoning. The maker of Modifilan is aware that it is being touted as a weight loss supplement and the maker wants it to be known that while it can help with weight loss the R and D has been focused on detox. Folks I hate to break it to you but there is no such thing as a magic bullet. You cannot simply take something to lose weight. YOU NEED TO CHANGE YOUR BEHAVIOR. YOU NEED TO CHANGE YOUR EATING HABITS AND EXERCISE HABITS. Brown seaweed extract does increase fat metabolism and increasing fat metabolism will help you lose weight. And, using Modifilan within the context of a balanced diet and exercise regime is your best approach. Also consistency and commitment are important, you need to follow through to reap results. Actual fat intake is only part of the picture, natural, raw, plant oils and fats are good for you, actually many fats are good for you such as fish oils. Fat intake may not be the "problem". But, sugar intake is an issue, there are no two ways around this. Your body will store excess sugar it can't metabolize as fat this will cause weight gain. While we have benefited in sales from the increased attention this product has received we encourage a balanced lifestyle with supplements as an addition. They are called SUPPLEMENTS, ie they supplement the diet. If the diet is poor do not expect much from the supplement or even a lasting change. We have many natural healthy options available from raw plant proteins, raw healthy fats and low glycemic sweeteners. Green powders are also a great aid to weightloss they provide a wealth of nutrients with a minimum of calories. Please refer to our earlier Post for some ideas and suggestions. Modifilan will work within reason when used wisely and in combination with a balanced diet and plenty of exercise. It was also reported that the use of licorice extract along with modifilan boosts the weight loss potential of the product. SummaryModifilan combined with a healthy diet and exercise will be a benefit to your weight loss goals. But, only if you are consistent with the program you set for yourself. Including green foods such asGreens First Powder in your diet will give you nutrition without calories. Also healthy oils, particularly coconut oil is a great aid to a fitness regime because the medium chain triglycerides get used as energy quickly by the body. Low glycemic sweeteners are also an important piece of the weightloss picture, you need to cut out the refined sugar and related products. Consider using stevia, agave nectar or coconut sugar instead; shop for these at our Sweeteners page. Last but not least; the emotional level. It would be incomplete to leave the emotional piece of the equation out. Food has a very powerful emotional impact on our lives and making changes around food can be very challenging on the emotional level. I, Mark D'Aquila the author of these posts am also a specialist in the use of flower remedies for emotional healing. And, I can help you address any emotional condition you want to change. Please contact me via my site to learn more and when you mention Zebra Organics you'll receive 15% off a personal consultation or any purchase. Could saturated fat be good for you? You have heard for years how it is a health enemy. But what if your were to learn that saturated fats were not only good for you but essential to your health...? Yes, it is true Saturated Fat is essential to your health. You may think I am crazy saying this and wondering if you are reading a health blog . . . I am not crazy and you are reading a health blog. This post is to dis-spell myths about saturated fats and cholesterol but are important to health. I feel we have been gravely mis lead by the low fat craze and I would like to illustrate why saturated fat is important and some of the functions of cholesterol. The case against cholesterol and saturated fats is based in both the politics of health and an incomplete understanding of health. In America there is a reductionist view of nutrition. Nutrition and human health are highly nuanced and intricate and to make the case that cholesterol is bad and saturated fats are bad is over simplified. While high cholesterol can be dangerous, cholesterol is completely needed for health. Butter oil capsules (pictured to the left) is a high quality saturated fat containing Vitamins K, E and CoQ enzymes. This is just a small list of ways cholesterol contributes to health. Luckily today there is an awareness of the need for healthy fats in the diet, including healthy saturated fats. Some good sources of this nutrient include grass fed animal products including but not limited to butter and milk. Fish oils are also a great source of healthy saturated fats, if you are going to eat fish it is recommended to consume small bodied fish such as sardines and anchovies. Lets not forget, coconut oil an excellent source of healthy saturated fats that tastes great, smells of ambrosia and is from a sustainable vegetable source. Historically Cod liver oilhas been used as a source of healthy saturated fats. It is also a well know source of vitamin D.
*The information in this blog post is not medical advice, I am not a medical doctor and the information is not intended to provide personal medical advice. Medical advice should only be obtained from a medical professional. This excellent grade Coconut Oil is amazing. Its scent intoxicating. One of the purest natural oils with its superb stability, preservatives are not needed. Besides being one of the healthier oils Coconut Oil tastes great. Use our aromatic Coconut Oil in place of butter or other oils, as a spread, in smoothes, or foods recipes. Excellent for raw foods, dehydrated food, sautés, baking, ice cream, or other frozen desserts. This Extra Virgin Coconut Oil can also be applied topically to the skin as a natural body oil, lip balm, and to the hair for extra shine and that healthy vibrant look. It absorbs well after a short time. 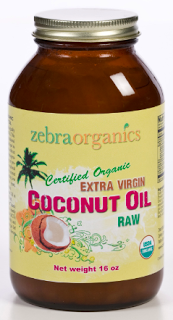 Zebra Organics is delighted to bring you this Raw, Cold-Pressd, Certified Organic, Extra Virgin Coconut Oil. 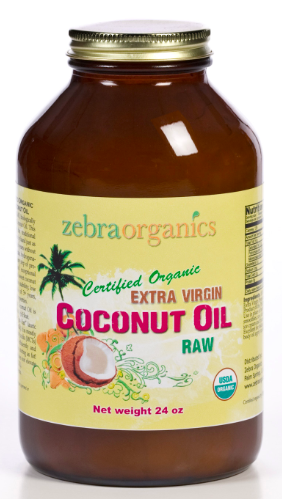 Zebra Organics Coconut Oil is made from certified organic coconuts grown in the clean tropical pacific region of the Philippines. First the Coconut flesh is low-temperature dried and then cold-pressed to yield an oil higher in anti-oxidants. After pressing, the bottles are filled and delivered to you. With a perfect balance of delicious flavor you can taste the freshness of our Coconut Oil. And it is very stable meaning it will last a long time in your kitchen... three plus years. The health benefits of coconut oil are many. And an excellent support for weight loss. Contrary to the "bum wrap" coconut oil received some years ago studies clearly show just how healthy coconut oil is for us. The benefits of coconut oil can be attributed to the presence of lauric acid, capric acid and caprylic acid, and its properties as antimicrobial, antioxidant, antifungal, and antibacterial. This rich, elegant, healthful Coconut Oil, from Zebra Organics, comes in an ecco-friendly, amber glass jar to protect from light. Processed in an organic and kosher space where nothing but coconut oil is processed. Available in both 16 fl oz and 24 fl oz amber glass jar.